This past October, Phipps Conservatory and Botanical Gardens, located in Pittsburgh, Pennsylvania, was invited to participate in the First Lady Michelle Obama’s Final Garden Harvest at the White House. There were several tracks represented by students and chaperones and I was proud that Phipps had the opportunity to represent the Let’s Move! Museums and Gardens track in recognition of its work on the Let’s Move Pittsburgh Program. 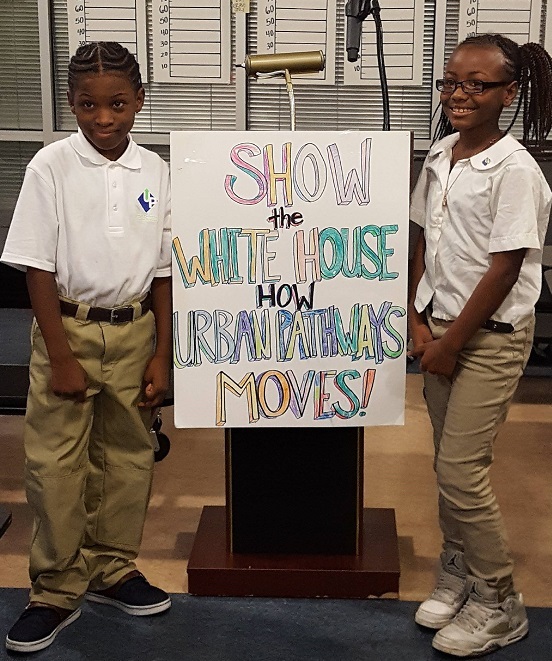 Urban Pathways K-5 College Charter School hosted a pep rally for students Bruce (grade 5) and Lemiah (grade 4) to send them off to the White House! Phipps has fully embraced healthy lifestyles on its campus since the inception of Let’s Move! Inspired to offer healthy choices to guests, Phipps has made changes to its café offerings and guest experience to make it easier for guests to make healthy choices. Café Phipps has eliminated soda from the menu and features nutritious food options with a focus on local and seasonal foods. Outside of the café, Phipps has a healthy play market and a hopscotch game for children, a series of physical activity prompts that integrate physical activity into the guest experience, and more. Launched by Phipps in 2011, Let’s Move Pittsburgh is a collaborative program that provides Southwestern Pennsylvania’s children and their caregivers with the knowledge, tools and support needed to make nutritious food choices and lead active lifestyles. As the Let’s Move Pittsburgh program director, I had the pleasure to attend the Final Garden Harvest accompanied by Bruce and Lemiah, two local students of Urban Pathways K-5 College Charter School, and Linda Williams, their physical education teacher. This school was selected to join us because of its outstanding participation in our Champion Schools program. Picture from left to right are Bruce, Linda Williams, physical education teacher at Urban Pathways, Let’s Move! Director, Deb Eschmeyer, in the White House garden, Lemiah and Mary Kathryn Poole, Let’s Move Pittsburgh Program Director. Students Bruce and Lemiah spent an exciting afternoon at the White House where they had the opportunity to harvest in the White House garden alongside Michelle Obama and her celebrity helpers. Following the harvest, the students prepared (and then ate) a fresh, healthy flatbread with White House chefs. Michelle Obama gave remarks about the impact of Let’s Move! through the years and her plans for the White House garden. All of the guests had the chance to walk through the garden and observe the abundance of colorful vegetables growing on the historic grounds. 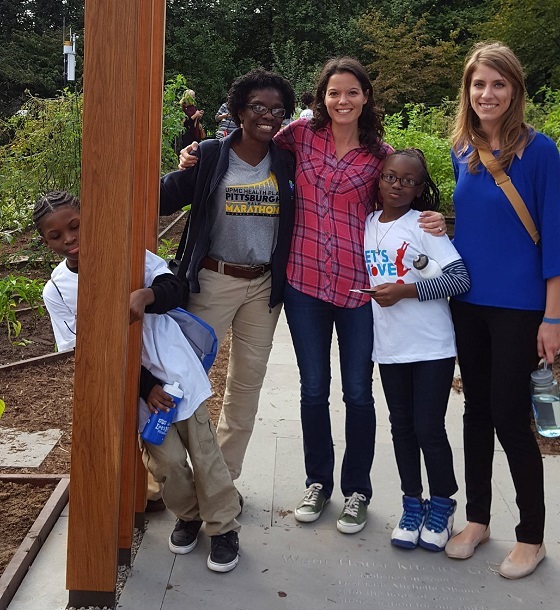 It was incredible to see students from across the country come together to pick fresh vegetables and share a healthy lunch in the company of the First Lady and other health advocates. Bruce and Lemiah had the pleasure of harvesting and eating with astronaut Kjell Lindgren and singer Ashanti. They also had the opportunity to meet both the First Lady and President Obama. The day flew by, but the wonderful memories will last a lifetime. On behalf of Phipps, I am so grateful to the Institute of Museum and Library Services for inviting us to participate in this iconic event at the White House. I enjoyed celebrating what Let’s Move! has accomplished in the last six years and l left feeling energized to keep this important work moving forward for years to come. 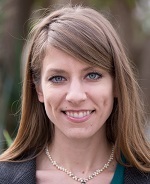 Mary Kathryn Poole is the Let’s Move Pittsburgh Program Director for the Phipps Conservatory and Botanical Gardens.